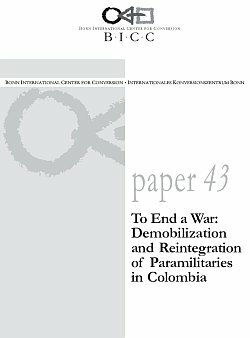 Paper 43 is a result of a cooperation between the Colombian foundation “Ideas para la Paz”, the Universidad de los Andes, and the Bonn International Center for Conversion (BICC), which started in 2002 at a conference in Bogota entitled “Voces y opciones del desarme: Enseñanzas adquiridas de la experiencia”. This paper gives an update of the demobilization efforts undertaken until the end of 2004. It is hoped that the discussions between the Universidad de los Andes, the Foundation Ideas para la Paz and the relevant actors in the demobilization process will continue and will make it possible for the researchers to continue their evaluation and monitoring of this process.